This campaign map shows the route of the 36th Infantry Division during World War II. This chart is available for purchase at HistoryShots.com. 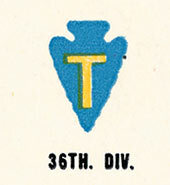 The 36th Infantry Division landed in North Africa, 13 April 1943, and trained at Arzew and Rabat. It first saw action, 9 September 1943, when it landed at Paestum on the Gulf of Salerno. The waiting enemy launched counterattacks, but the 36th advanced slowly, securing the area from Agropoli to Altavilla. After a brief rest the 36th returned to combat, 15 November. It captured Mount Maggiore, Mount Lungo, and the village of San Pietro despite strong enemy positions and severe winter weather. This grueling campaign was marked by futile attempts to establish a secure bridgehead across the Rapido River, 1 January to 8 February 1944. After assisting the 34th Division in the attack on Cassino and fighting defensively along the Rapido River, the 36th withdrew, 12 March 1944, for rest and rehabilitation. On 25 May, the Division landed at Anzio, drove north to capture Velletri, 1 June, and entered Rome on the 5th. Pushing up from Rome, the 36th encountered sharp resistance at Magliano, but reached Piombino, 26 June, before moving back to Paestum for rest and rehabilitation. On 15 August, the Division made another assault landing against light opposition in the RaphaelFrejus area of Southern France. A lightning dash opened the Rhone River Valley. Montelimar fell, 28 August, and large Nazi units were trapped. The 36th advanced to the Moselle River at Remiremont and the foothills of the Vosges. In a grinding offensive, the Division crossed the Meurthe River, breached the Ste. Marie Pass and burst into the Alsatian Plains. The enemy counterattacked, 13 December, and the 36th held in the Colmar Pocket. On the 20th the Division resumed the attack, advancing northward along the Rhine River to Mannheim meeting heavy resistance at Haguenau, Oberhofen, and Wissembourg. The 36th moved to the Danube, 22 April 1945, and attacked the "National Redoubt" at Kunzelsau on the 30th in its final action.